BierBeisl, a charming little outpost in Beverly Hills serving Austrian food with Austrian, German and Czech draft beers on tap, is founded and helmed by former Patina Chef de Cuisine Bernhard Mairinger. An honoree on Zagat’s recent 30 Under 30 Los Angeles list, Chef Mairinger looks to be realizing his dream of bothÂ creating and curating an Austrian restaurant he can call all his own. With his formal culinary training beginning at four-star Austrian Classic Hotel Aichinger at the age of 15, his work took him through hotels in Switzerland and London, then Da Gianni in Germany before landing in Los AngelesÂ at Nick & Stef’s andÂ Patina. But at BierBeisl, with its modest yet adequate furnishings and finish, it’s clear that 6’7″ Chef Mairinger is happiest in probably the smallest kitchen he’s ever worked in. He brings a refinement to each of his dishes that will debunk the “rich and heavy” stigma people often attach to Austrian food. The KÃ¤sekrainer comes luciouslyÂ infused with swiss and laid atopÂ tarragon mustard.Â A fresh grating of horseradish is just the kick needed for thisÂ punchy bite. 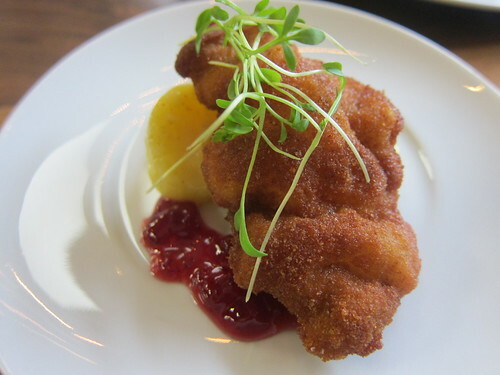 TheÂ Veal Schnitzel, fried in clarified butter,Â was also perfectly breaded and seasoned. And don’t forget the dessert. TheÂ Apfelstrudel isÂ so delicate that it could only have been handcut – and made -Â with enormous care. 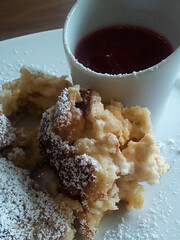 And if you’ve never had Kaiserschmarrn, BierBiesl would be the place to conduct your initiation. German for “emperor nonsense,” this strictly Austrian treat has such fun texture and flavor (think wet-dry pancake fluff – but better) with which to dip in a delicious plum compot. BierBeisl also features a schnapps bar – the first that I’ve noticed in L.A. Made from the fermentation of pure fruits at carefully controlled temperatures with no added sugar or fragrances, schnappsÂ is something that Bierbeisl hopes to share with Angelenos through tastings and pairings. There are a lot of other things I’ve yet to try – including pairings – at BierBeisl. 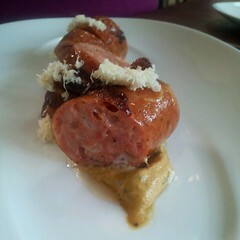 Beer and sausage tastings are available: 3 course + 3 beers for $32 or 5 course + 5 beers for $42. Bratwurst, Weisswurst, Polish, Wiener, Bier Cabanossi are the classic sausage offerings on the menu, whereas Stiegl is the Austrian beer on tap currently. Also, with late closing times – especially in comparison with its upscale retail environment – BierBeisl looks to be a destination for late night chef grub and post-Troubadour concert fare. It’s a welcome upstart to a neighborhood that can benefit from a varied, younger energy – unrelated to a certain cupcake ATM, that is. This entry was posted in beer, Beverly Hills, Food, wine and tagged 30 Under 30, Austrian, beer, Bernhard Mairinger, Beverly Hills, BierBeisl, Food, gulasch, Patina Alum, Santa Monica Blvd, schnitzel, Zagat. Bookmark the permalink.